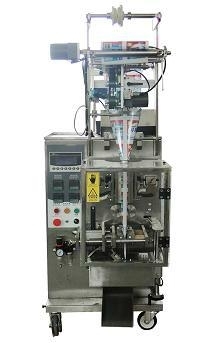 VFS200A series packing machine is to realize the trilateral sealing packing machine, can produce pillow bags style, form a complete set of different feed device, can realize the granules, tablets, pills, irregular objects of different materials such as packaging. Product features: the machine structure is compact, firm, reasonable design, simple. Set of bag making, filling, sealing, printing and counting into an organic whole, using step motor to pull membrane, stable performance. Cutting knife can be used in a flat knife, serrated, crossed one of three ways. PLC control components adopt international famous brand product, can at home and abroad and all kinds of automatic metering equipment supporting the use. The aerodynamics design of advanced and traditional packaging machine, to ensure better action is simple and practical.